Fast action spring assist knives give you a tactical advantage when every second counts. This black tanto spring assist knife is a fast and stylish tactical folder. Window breaker and belt / cord cutter built into handle. Sharpened 440 stainless steel blade. Includes pocket / boot clip. 8 1/2 in. overall opened, 3 3/4 in. blade, 4 3/4 in. closed. This knife was great for such a low cost. Looks good, feels fairly comfortable. Would recommend. I got this knife and am very pleased. It is a double liner and opens nice with the assisted opening, the bad is you will have a hard time with out the assist. I showed this knife to a couple friends and now have to order 2 more for them. A real battleship as far as knives go. 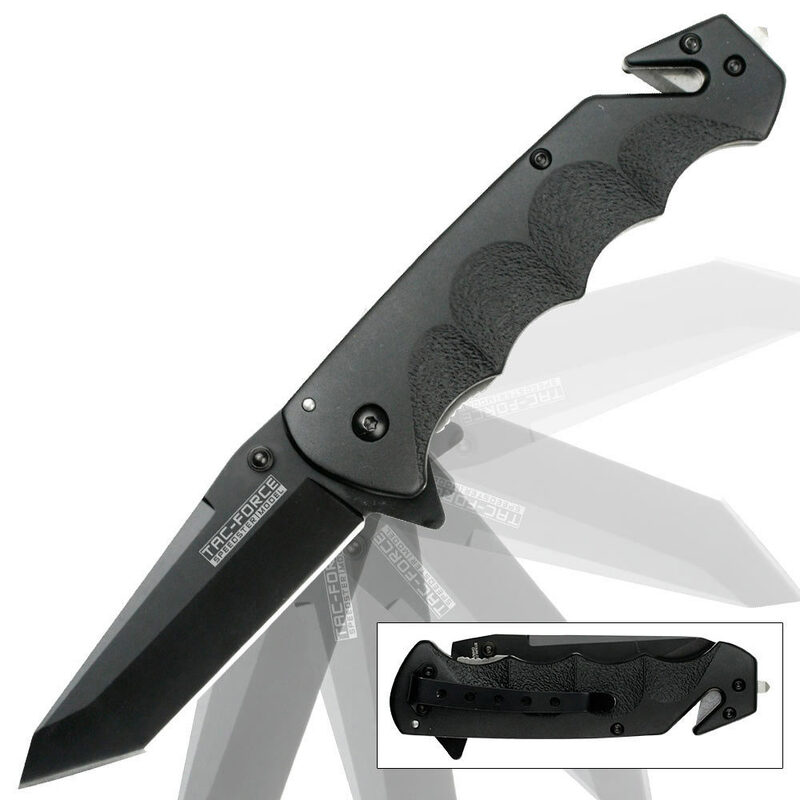 This very robust tactical rescue folder is nice quality and comfortable in the hand. I love mine and believe it is definitely worth your consideration. Everything about it is fantastic except one thing. The spring isn't very strong so when I go to open it it doesn't quite make on its own so I have to flick it to get it lock. very sturdy, long lasting knife, exactly as it is seen in pictures. occasionally, i have to tighten the bolt that holds the blade on, but it's not a big problem. the spring is the best of all the spring-assisted blades I own, and I have had this knife for 2 years. great purchase from trueswords! The item I got wasn't exactly what was shown in the picture or the description, but its still nice. The blade is only a tad bit over 3.5 inches long, not 3.75 inches, and the blade has "Tac-Force" printed on it instead of being blank as shown. It does have a tanto point, but the unsharpened edge is shaped a little different than pictured. However, it is still a nice knife. It flips open quick, feels good in your fingers, and the blade is sharp.